A quick how-to as we head into planting time. 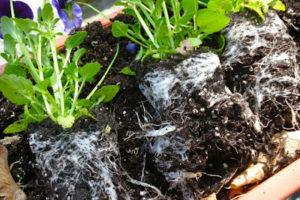 When you succumb to the siren call of the flowers in the garden centre, especially annuals planted in cell packs (those softer plastic pots with multiple, small chambers), it’s likely their root systems will be pretty bunged up. Chances are, they’ll look something like this image. Note how the white roots are filling in the shape of the cell-pack. The bottom of the root system is quite square and condensed. That’s because the roots are reaching the outside wall of the container and growing round and around and around and around. 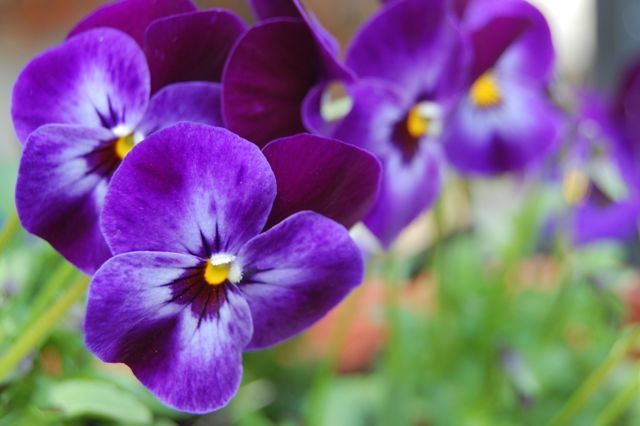 The plants will establish themselves better if they’re free to venture out into their new, larger growing space. When you see this, grit your teeth and prepare to be ruthless. Don’t be too afraid of breaking the root filaments. 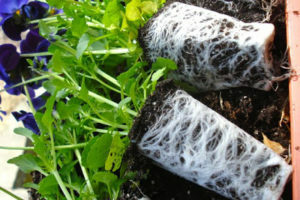 The liberated root system will then look like the image at right. Plant your charms and water well. Watch the weather immediately after planting. If it’s viciously hot and sunny, you might want to move the planter into a shadier spot for a day to let them recover. But, really, it’s for their own good. They’ll survive and thrive better when their roots are allowed to explore beyond their former constipated state. This holds true for most root-bound potted plants. And don’t just take my word for it. At Canada Blooms this year, Sarah heard Marjorie Mason-Hogue (now, Marjorie Mason) say just the same thing.